The All New, All Daring Delusional Honesty! : 5 Questions With Greg Pak: "Heart of the Monster"
Great interview, Gary! I'm not sure how I feel about Pak leaving the series (loved Planet Hulk, but I have many complaints since), but I'm really eager to read "Heart of the Monster" thanks to these teasers! That cover image preview is simply 'smashing'! I can't wait to see Wendigo and Bi-Beast again. 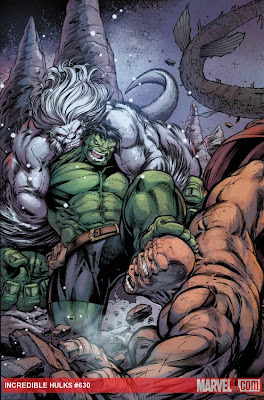 I really enjoyed Incredible Hulks #630: Heart of the Monster Part 1, and I can't wait to read the next five final issues. I'm still curious if Skaar will show up or even Caiera, if only because Greg Pak was their creator and one would think it would only seem fitting that they would be in Greg Pak's last Incredible Hulk storyline, ya know? I guess we'll just have to wait and see. I'm also wondering who that best friend of Bruce Banner is? Doc Samson is dead... or so we think considering the Chaos War storyline and such. I honestly can't think of anyone, because Bruce Banner isn't really close to the likes of Reed Richards or Tony Stark. I mean, there's several heroes that come to mind, but I just don't know. What do you think? I'm also intrigued by how the villains; Lord Armageddon, Umar, Bi-Beast, Wendigo, and Fin Fang Foom will play out in Heart of the Monster... not to mention Betty/Red She-Hulk & Tyrannus. They all have a connection with the Hulk in one form or another, so it'll be interesting to see what happens. Anyways, I'll be watching out for the new preview art that we might get once you update this entry! Until then, talk to ya later! You did not ask the most important thing: "Why did you ruin everything with IH#622? what's your point ? Hulk should not lose at his own game"
Great interview as always, Gary! I'm really looking forward to reading this final storyarc (have to wait another week to read TIHs #630). Sounds intense! Love the choice of villains, and it's especially awesome to see Tyrannus (who's usually been portrayed as a second-rate Hulk rogue) getting a decent showing.